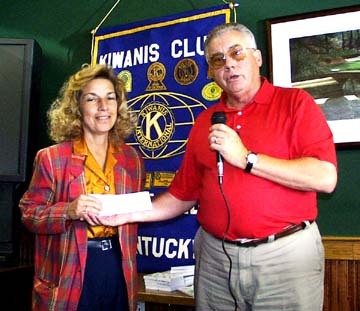 September 11 - 6:30 p.m.
September 25 - 6:30 p.m.
Phllis Adams (left), Head Start Director for the Kentucky River Foothills, accepts a $5,000 check from the Richmond Kiwanis Club for work with Richmond Children. Presenting the check is Dr. Kenneth Clawson (right) , governor-elect of the Kentucky-Tennessee district of Kiwanis International, a member of the Richmond Kiwanis Club. * Car Seat Give Away program which provided safe car seats for those who needed such seats and instruction on the proper installation and use of these seats. * Wellness on Wheels vehicle which provided health information of children at health fairs, at schools, at the health department, and at local fairs. 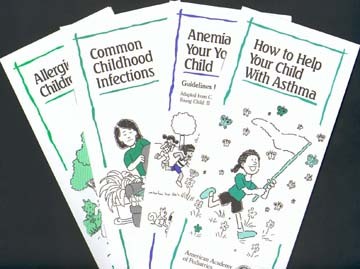 * Billboards on a variety of health and children issues. These billboards included advertisements on breast cancer, the effects of smoking and a variety of children's issues. These billboards are jointly supported by Children's Champions, two health department grants, Kiwanis support, and local businesses. * Videos provided to parents on a multitude of children's health and nutritional topics. 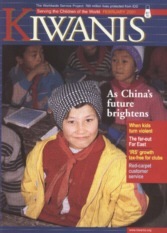 * Literature promoting children's health issues and readiness in reading and writing skills. * $778 was provided as matching funds for the Reading is Fundamental program with Head Start which then received $3,000 worth of book to be distributed to children. * A variety of promotional items (stickers, balloons, glow bracelets and key chains) with health and children's support related messages were given to children at sites visited by the Wellness on Wheels vehicle. "For every nickel we get I try to generate 6 or 7 or 8 cents in matching money," Adams said. 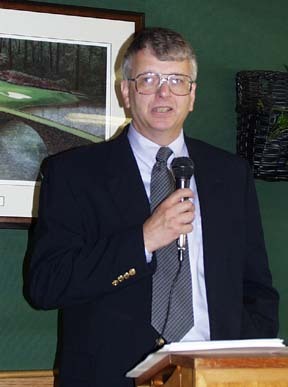 Kiwanis was recently approved to be the Madison County Early Childhood Council's Fiscal Agent. Adams said, "One of the major objectives of the Council is to assist day care workers in obtaining training requirements. This will include funding for training as well as for paying qualified substitutes who will cover while day care workers obtain required training." Adams added that dual objectives of the Madison County Early Childhood Education Council and the Richmond Kiwanis Club is to upgrade child care and safety for young children in Madison County. The Richmond Kiwanis Club presented Adams with a check for $5,000 to continue working with children during the 2001-2002 year. Dr. Kenneth Clawson, the governor-elect of the Kentucky-Tennessee district of Kiwanis International and a member of the Richmond Kiwanis Club, presented the check on behalf of the club. The Wellness on Wheels Wagon (WOW), one of the many projects supported by the Richmond Kiwanis, distributes health information to youth and schools in the Madison County Area. See here is Phllis Adams, Richmond Kiwanis member, who is seen providing information at the Berea Spoonbread Festival. The wagon was also provided information to youth at the Kiwanis Carnival. 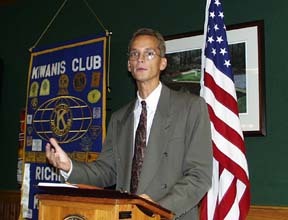 Bill Marshall of the University of Kentucky spoke to the Richmond Kiwanis club about Happy Chandler and Baseball's Pivotal Era on August 21. 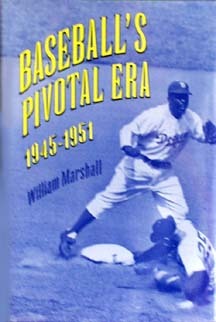 Marshall based his book on a series of eight interviews with Chandler and numerous other interviews. He described Chandler's love for the sport and his life prior to his appointment as a baseball commissioner. Marshall indicated that his appointment was largely the result of his long-time friendship with the owner of the Cincinnati Reds who later promoted him to become commissioner. He indicated that Chandler was an unlikely choice and proved to be a loose cannon. He seemed to support every element of the sport except the people who hired him; the owners. Marshall recounted the story of how Chandler helped to break the color barrier by supporting bringing in Jackie Robinson into the major leagues. He indicated that the record doesn't exactly support the meetings that Chandler purported to having on this issue but indicated that Chandler did support breaking the color barrier.